That last post about proposals for improving Main Street went very well, and then took on a life of its own about bike lanes. Some seem to feel that the removal of the fog lines on Main Street, and the repainting of the lines further from the curb have made the curb to the line an official bike lane. I haven't seen any signs, or bike symbols painted on the road to indicate this, or even a mention in the paper that this was the intent. It doesn't really matter though, for bicyclist it is a welcome change. Bicyclists have always been welcome on the road, in fact the "Share The Road" signs are meant to remind both motorists, and bicyclists to do just that. 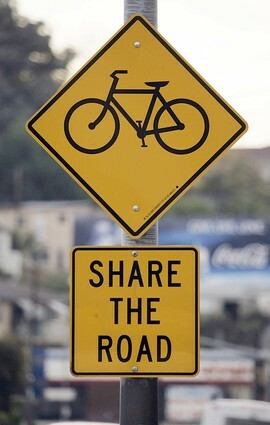 The laws that govern bicyclists on the road are similar to a motorist. Signals must be used to indicate turns, unless it is necessary t use two hand on the handlebars, bicyclists must obey traffic signs, and lights, and both cars and bikes must give pedestrians the right of way. I have a bike, have used it on the road. Before official bike trails there was no where else to ride. Having a skootch more room on Main Street will make riding a bit easier. Yes, the "bike lanes" get narrow at some turns, and eventually disappear, but the road is till there, and one is free to ride on any road in the Commonwealth except for the limited access highways (interstates), and highways specifically marked prohibiting bicycles. Contrary to what was written in the last post comment section Route 20 is not considered an interstate highway like I-90 is. Yes, they both wind their way between states, and in both cases go from coast to coast, but Route 20 is not limited access, nor is biking prohibited from that road. I don't think bicyclist are going to hop on their bikes and go shopping on Main Street. If the new lines will do anything they will give a little more bike riding room in the business district. Riding a bicycle on the sidewalk outside the business district is legal, thus no need for wider lanes, but they would be welcome there as well. On Route 148, where I live, dozens of bicyclists ride by on any weekend day, as well as during the week. They stay safe by following the rules of the road, and being alert. Since I don't know who's idea it was to widen the curb to line area, whether it was MADoT, of the Town, or what their true intention was, I really can't comment further. In any event, if it is an attempt to make the roads a bit safer for those on their bikes, that's great, and if it is for another reason all together, then the indirect effect for those pedaling their butts around town will be welcome as well. We just need to keep in mind that bicyclists are not intruders on our roadways, they are welcome, and there are laws that protect them, motorists, and pedestrians as well. If you don't feel riding your bike on Route 20 is safe for you to do, then don't. Section 11B. Every person operating a bicycle upon a way, as defined in section one of chapter ninety, shall have the right to use all public ways in the commonwealth except limited access or express state highways where signs specifically prohibiting bicycles have been posted, and shall be subject to the traffic laws and regulations of the commonwealth and the special regulations contained in this section, except that: (1) the bicycle operator may keep to the right when passing a motor vehicle which is moving in the travel lane of the way, (2) the bicycle operator shall signal by either hand his intention to stop or turn; provided, however, that signals need not be made continuously and shall not be made when the use of both hands is necessary for the safe operation of the bicycle, and (3) bicycles may be ridden on sidewalks outside business districts when necessary in the interest of safety, unless otherwise directed by local ordinance. A person operating a bicycle on the sidewalk shall yield the right of way to pedestrians and give an audible signal before overtaking and passing any pedestrian. (2)(i) The operator shall ride only upon or astride a permanent and regular seat attached to the bicycle; a passenger shall ride only upon or astride a permanent and regular seat attached to the bicycle or to a trailer towed by the bicycle. (ii) The operator shall not transport another person between the ages of one to four years, or weighing forty pounds or less, on a bicycle, except in a “baby seat”, so-called, attached to the bicycle, in which such other person shall be able to sit upright; provided, however, that such seat is equipped with a harness to hold such other person securely in the seat and that protection is provided against the feet or hands of such person hitting the spokes of the wheel of the bicycle; or upon or astride a seat of a tandem bicycle equipped so that the other person can comfortably reach the handlebars and pedals. The operator shall not transport any person under the age of one year on said bicycle. (iii) Any person 16 years of age or younger operating a bicycle or being carried as a passenger on a bicycle on a public way, bicycle path or on any other public right-of-way shall wear a helmet. Said helmet shall fit the person’s head, shall be secured to the person’s head by straps while the bicycle is being operated, and shall meet the standards for helmets established by the United States Consumer Product Safety Commission. These requirements shall not apply to a passenger if the passenger is in an enclosed trailer or other device which adequately holds the passenger in place and protects the passenger’s head from impact in an accident. (iv) A violation of clause (ii) or (iii) shall not be used as evidence of contributory negligence in any civil action. (3) The operator shall give an audible warning whenever necessary to insure safe operation of the bicycle; provided, however, the use of a siren or whistle is prohibited. (4) The operator shall park his bicycle upon a way or a sidewalk in such a manner as not to obstruct vehicular or pedestrian traffic. (5) The operator shall not permit the bicycle to be drawn by any other moving vehicle. The operator shall not tow any other vehicle or person, except that bicycle trailers properly attached to the bicycle which allow for firm control and braking may be used. (6) The operator shall not carry any package, bundle or article except in or on a basket, rack, trailer or other device designed for such purposes. The operator shall keep at least one hand upon the handlebars at all times. (7) Every bicycle operated upon a way shall be equipped with a braking system to enable the operator to bring the bicycle traveling at a speed of fifteen miles per hour to a smooth, safe stop within thirty feet on a dry, clean, hard, level surface. (8) During the period from one-half hour after sunset to one-half hour before sunrise, the operator shall display to the front of his bicycle a lamp emitting a white light visible from a distance of at least five hundred feet, and to the rear of said bicycle either a lamp emitting a red light, or a red reflector visible for not less than six hundred feet when directly in front of lawful lower beams of headlamps on a motor vehicle. A generator powered lamp which emits light only when the bicycle is moving shall meet the requirements of this clause. (9) During the period from one-half hour after sunset to one-half hour before sunrise, the operator shall display on each pedal of his bicycle a reflector, or around each of his ankles reflective material visible from the front and rear for a distance of six hundred feet, and reflectors or reflective material, either on said bicycle or on the person of the operator, visible on each side for a distance of six hundred feet, when directly in front of lawful lower beams of headlamps of a motor vehicle. This clause shall not prohibit a bicycle or its operator to be equipped with lights or reflectors in addition to those required by clauses (8) and (9). (10) No bicycle shall be operated upon a way with handlebars so raised that the operator’s hands are above his shoulders while gripping them. Any alteration to extend the fork of a bicycle from the original design and construction of the bicycle manufacturer is prohibited. (11) The operator of a bicycle shall report any accident involving either personal injury or property damage in excess of one hundred dollars, or both, to the police department in the city or town in which the accident occurred. Any federal product safety standards relating to bicycles which are more stringent than the requirements of clauses (7) through (10), inclusive, shall supersede said requirements. Competitive bicycle races may be held on public ways, provided that such races are sponsored by or in cooperation with recognized bicycle organizations and, provided further, that the sponsoring organization shall have obtained the approval of the appropriate police department or departments. Special regulations regarding the movement of bicycles during such races, or in training for races, including, but not limited to, permission to ride abreast, may be established by agreement between the police department and the sponsoring organization. Violations of any provision of this section except violations of subclause (iii) of clause (2) shall be punished by a fine of not more than twenty dollars. The parent or guardian of any person under age eighteen shall not authorize or knowingly permit any such person to violate any of the provisions of this section. A bicycle operated by a person under the age of eighteen in violation of this section may be impounded by the police department, or in a town which has no police department, by the selectmen, for a period not to exceed fifteen days. A violation of any provision of this section by a minor under the age of eighteen shall not affect any civil right or liability nor shall such violation be considered a criminal offense. For the updated Massachusetts Bicycle Law click here. Time For Plan B; I'm In, Are You?